Abstract: The development of efficient and sustainable processes (especially in terms of biobased chemicals and fuels production) is currently the focus of many research and development, which opens great opportunities for chemical process optimization and developing intensified reactor technologies. This presentation will introduce our recent work on the combination of continuous flow microreactors as well as centrifugal separator and contactors in a variety of (biobased) chemical processes including among others C5/C6 sugar dehydration to furanics, oxidation of 5-hydroxymethylfurfural, biodiesel synthesis and lactic acid extraction. The reactor operating principles and transport characteristics, process intensification potential, effect of homogeneous/heterogeneous catalysis as well as chemistry insights will be discussed particularly. Jun Yue obtained his bachelor degree from the Department of Chemical Engineering at Tianjin University in China in 1997 with specialization in Industrial Catalysis. He earned his PhD degree in Process Engineering from Université de Savoie (currently known as Université Savoie Mont Blanc) in France in 2008, which was further supported by a joint PhD program with Dalian Institute of Chemical Physics, Chinese Academy of Sciences in China. Between 2009 and 2014, he has been working as a postdoc in the Laboratory of Chemical Reactor Engineering at Eindhoven University of Technology in the Netherlands. Since August 2014, he has been appointed as an assistant professor in the area of green chemistry and technology at the University of Groningen. 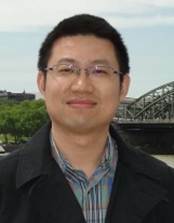 The sub-group of Jun Yue at the University of Groningen is active in the development of novel reactor concepts (among others, advanced microreactors and centrifugal contactor separator devices) combined with precision catalysis for highly efficient chemical and energy conversion, with a strong emphasis on biobased chemicals and fuel synthesis. Currently, Dr. Jun Yue is supervising 6 PhDs and 8 master students.